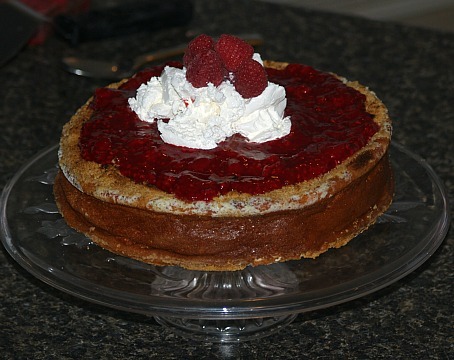 Learn how to make raspberry cheesecake recipes and you will love the taste; everybody does. No matter how you put this fruit with creamy delectable cheesecake recipes it is simply delicious; it might be a plain one or chocolate. Settlers brought raspberry seeds with them to the American colonies to start these plants. Later in New York a man named William Prince started a nursery selling these plants so we can thank him for the popularity of these tasty berries here in the United States. When you learn how to make raspberry cheesecake recipes, like strawberry cheesecakes they are very popular because of the abundance and great availability of the berries. If you ever visit Mount Vernon in Northern Virginia, you will understand and appreciate the impact that George Washington had in promoting this sweet berry. Today raspberries are commercially produced in many of the Midwestern states, New York, Oregon, California and the largest amount produced in Washington State. They are now available for purchase throughout most of the year. Knowing how to make raspberry cheesecake recipes you might find to be very seasonal; for me it is best to make them in the springtime when the berries are available. I love to walk the mountain areas of Tennessee and in Ohio to collect these berries growing wild. They are so abundant; large bushes grow everywhere and they are so full of berries. Wild raspberries are so sweet and highly perfumed that only a few in a bowl of fresh fruit will make a difference in the taste. The flavor of these wild ones is wonderful plus they are free. Great satisfaction comes from all angles of this project! This is one of the raspberry cheesecake recipes which requires no baking. The chocolate crusted dessert with raspberry glaze sets up quickly for serving as a special dessert recipe. Combine and mix cookie crumbs with melted butter; press into bottom of spring form pan. Beat cream cheese on medium speed gradually adding milk; beat in juice, zest and pudding mix. Slowly mix until mixture begins to thicken; fold in 3 cups Cool Whip until well blended. Spread mixture into cookie crust; spread remaining Cool Whip over the filling. Put jam in blender and process until runny; drizzle over whipped topping. This is one of the raspberry cheesecake recipes made easy with a prepared pie crust. Again a great combination of flavors in the chocolate and berries. Beat cream cheese on medium until smooth; beat in sugar and vanilla. Fold in raspberries reserving a few for garnish; pour mixture into crust. Bake 30 to 35 minutes; cool completely and refrigerate. Combine all glaze ingredients except vanilla in a heavy saucepan. Stir constantly over low heat until mixed and chocolate is melted. Add vanilla; pour over cold cheesecake and refrigerate at least 3 hours. 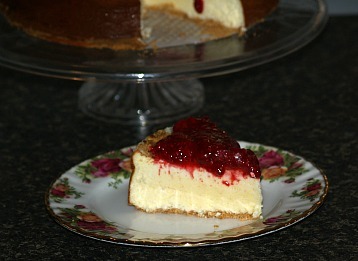 This is another of the raspberry cheesecake recipes which does not need baking; only the crust. The gelatin helps the dessert to set up in refrigerator. Combine crumbs, sugar and butter; press into bottom of 9 inch spring form pan. Sprinkle gelatin over cold water in a small bowl; let stand 5 minutes. Add boiling water; stir until gelatin dissolves. Beat cream cheese, sugar and vanilla in mixing bowl; gradually add raspberry sauce and gelatin mixture; mix thoroughly. Pour mixture into baked crust; refrigerate overnight. Remove sides of pan; spread seedless preserves over the top. Garnish with shipped cream to serve. This is one of the raspberry cheesecake recipes that is a little different with the combining of the raspberries with lemon. It also is also a low fat raspberry cheesecake recipe; use a sugar substitute for a sugar free recipe. You will find it very delicious! Sprinkle pan with ½ cup graham cracker crumbs; set aside. Beat cream cheese on medium speed until creamy; gradually add ¾ cup sugar. Add egg substitute, 1 tablespoon lemon rind and vanilla; beat until blended. Beat egg whites on high speed until soft peaks form; gently fold into cream cheese mixture. Pour batter into prepared pan; bake for 45 minutes or until lightly brown. Combine ¼ cup sugar and sour cream; spread over cheesecake. Sprinkle with remaining ¼ cup graham cracker crumbs. Bake for 5 minutes at 450F degrees; remove from oven and let cool completely. Run knife around edge of pan to release sides; cover and chill at least 4 hours. Combine raspberries and remaining ½ cup sugar in small saucepan. Cook raspberries over medium low heat stirring until sugar dissolves. Strain mixture discarding solids; stir in 1 teaspoon grated lemon peel and lemon juice. Make raspberry cheesecake recipes in a swirl using raspberry jam. Line pastry shell with 2 layers heavy duty foil; bake 5 minutes and REMOVE foil. Bake shell 5 minutes longer; remove from oven and set aside. DECREASE OVEN TEMPERATURE to 350F degrees. FOR FILLING beat cream cheese, sugar and vanilla until smooth. Add eggs beating on low speed just until combined; pour into pastry shell. Stir jam; drizzle over the filling; cut through filling with knife to swirl jam. Bake for 25 to 30 minutes or until center is almost set; cool on rack for 1 hour. Refrigerate overnight; if desired pipe whipped topping around edges to serve. FOR CRUST combine crumbs and butter; press in bottom of 10 inch spring form pan. FOR FILLING pour evaporated milk into mixing bowl. Place bowl WITH beaters in freezer until ice crystals form. Beat with mixer until peaks form the consistency of whipped cream; refrigerate. In another bowl dissolve gelatin in boiling water. Let gelatin stand until cool and add lemon juice. Beat the cream cheese with sugar and vanilla until smooth and creamy. Stir the gelatin into cream cheese; fold in the whipped milk. Spread mixture into crust lined pan; refrigerate until firm (several hours). Combine juice and cornstarch in saucepan; cook and stir over low heat until thickened. Cool sauce then stir in berries and chill; spread over cheesecake and refrigerate. Learn how to make raspberry cheesecake recipes with baking mix crust. TO MAKE CRUST combine and mix baking mix, sugar and butter until crumbly. Press in ungreased 9X13 inch baking pan; bake 10 to 12 minutes until golden. FOR FILLING beat cream cheese and powdered sugar until smooth; set aside. In another bowl beat whipping cream until stiff; fold into the cheese mixture. Swirl HALF of the raspberries through the cream cheese mixture. Spread “swirled” mixture over the baked crust. Spread remaining berries gently over the top. Cover and freeze until firm; stand at room temperature 15 minutes before cutting. TO MAKE CRUST combine and mix the crumbs, sugar and butter. Press mixture firmly into a 7X11X 1 ½ inch baking pan. Bake for 8 minutes; cool thoroughly. TO MAKE FILLING beat egg YOLKS in large mixing bowl until thickened. Add cream cheese, sugar and salt to bowl; beat until smooth and light; set aside. Beat egg WHITES in another bowl until stiff peaks form; set aside. Beat the heavy cream until stiff; fold cream and egg whites into the cream cheese mixture. Crush raspberries in blender to pulp; gently swirl HALF of pulp through cheese filling. Spread mixture in prepared crust; spoon remaining pulp over the top. Using a knife swirl the pulp gently; place in freezer and freeze firmly. Cover cheesecake with plastic wrap and return to freezer. Remove from freezer 20 minutes before serving; makes 6 to 8 servings. I hope you enjoy making these raspberry cheesecake recipes; vanilla or a chocolate raspberry cheesecake recipe, baked or a no baked cheesecake recipe, no sauce or raspberry sauce recipe made with chocolate cookie crust or vanilla wafer crust.